CommunicAsia is the premier sourcing and knowledge ICT platform in Asia, this year it will bring together a comprehensive display of cutting-edge technologies. The event will be held at Marina Bay Sands, Singapore during 23rd to 25th May 2017. This year the the theme of CommunicAsia is next generation solutions, digital transformation of business and cities. It will also spotlight the latest in the artificial intelligence, internet of things, cloud, big data, ibeacon, hardware integration, enterprise mobility, fintech solutions, virtual reality, and many more. Business and trade professionals can take advantage of this mega ICT expo by participating in this event. Here we are suggesting some companies who are participating in CommunicAsia 2017 and you can’t afford by not visiting their stand if you are planning to visit the event. 1) ACER INC. : Founded in 1976, Acer is one of the world’s top ICT companies and has a presence in over 160 countries. Acer Inc mission is breaking barriers between people and technology. With the same motive Acer Inc Taiwan is exhibiting in CommunicAsia 2017 event. They will be available at stand BQ2-01 during the show. 2) CDN Solutions Group: Founded in 2000, CDN Solutions Group is a Software development firm, whose ultimate mission is to provide quality and innovative IT solutions to solve crucial business issues. CDN is a leading information technology service provider company and have corporate headquarters in India, USA, Australia, Europe. CDN’s employees are dedicated to the research, marketing, design, development, test, sale, and support of products and solutions to provide you the best solution. So definitely you can’t miss to visit their stand BE2-05, if you are taking part in CommunicAsia 2017. Know more here. 3) PCCW Global: PCCW is a leading telecommunications provider company offering the latest voice and data solutions to multi-national enterprises and communication service providers. They will be present in CommunicAsia 2017 event at stand 1K2-01 to solve telecommunication issues in business. 4) RAD: RAD is a global provider of network access and telecommunication solutions. This year at CommunicAsia, RAD will showcase how to open your network to new business using network functions virtualization. Meet the delegates of RAD at stand 1H2-07 and solve your network issues in business. 5) SCTV: SCTV is Vietnam’s leading provider of communications and telecommunications services. This year, SCTV is exhibiting in global ICT expo CommunicAsia 2017 to showcase latest solutions in cable television network at stand BM3-01. So if you are attending CommunicAsia 2017 event and need your business related solution then visiting these companies can be a good idea. 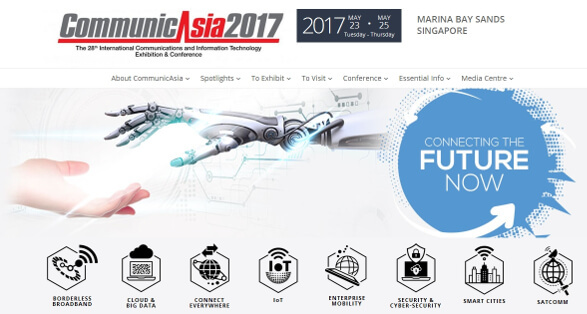 Know more about Information technology solutions in CommunicAsia 2017 here.